The city has released details of a plan to rezone swathes of Gowanus to support new housing, jobs and green space. Where new residential development is permitted, new buildings would be required to provide a portion of permanently affordable housing under the Mandatory Inclusionary Housing (MIH) program. The plan also looks to right the missteps of previous zoning changes along 4th Avenue that failed to mandate affordable housing or street-level retail by applying MIH and increased density options to future developments that strive to make the street more pedestrian friendly. On the vacant city-owned Public Place site, at the corner of Smith and 5th Streets, the Department of Housing Preservation and Development (HPD) will spearhead the development of a “major” affordable housing development. The sewer and transit systems will be improved through various easements the city wants to promote workforce development and job training opportunities for NYCHA and other neighborhood residents, particularly for City-sponsored projects. At the center of the plan, is the long-maligned Gowanus Canal, a so-called Super Fund site to be dredged of 17,000 cubic yards of contaminated sediment deposited by the industrial residents of the neighborhood’s past. The massive clean-up will be completed when the bottom of the canal is capped, ultimately turning it into a clean and contaminant-free waterway. A spokesman for the EPA explained, “The cleanup plan focuses on dredging the highly contaminated sediment that has accumulated on the bottom of the canal as a result of industrial and sewer discharges and preventing re-contamination of that sediment. The remedy also calls for stabilization and capping of contaminated sediments that are not targeted for removal. The bulk of the pollution in the canal is in these sediments. Disposal of all contaminated sediment at a facility out of the area will be done by barging the material. 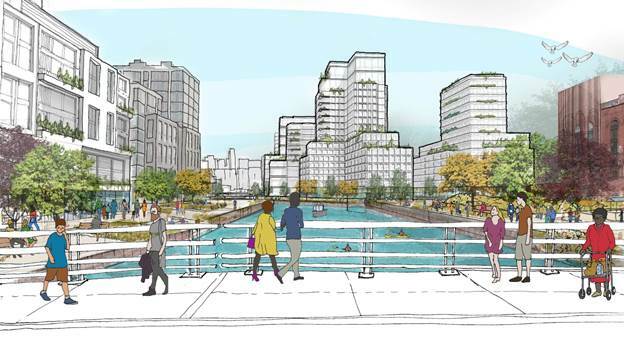 “The Gowanus draft zoning proposal is a strong next step toward the sustainable, inclusive, mixed-use neighborhood that the community has been envisioning for many years,” said New York City Council Member Brad Lander. “The draft zoning proposal and framework updates address issues of environmental remediation and sustainability, a dynamic and resilient waterfront, significant new affordable and market-rate housing, public housing improvements, preserving the ‘Gowanus mix’ of arts and manufacturing, integrated schools, historic preservation, new open space, and school and transit improvements. Following a public review of the proposal, a Draft Environmental Impact Statement and land use application will be made before the official ULURP process begins. This report was updated to include a statement from the EPA.